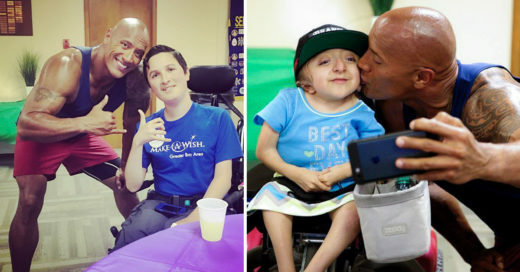 The Rock visita a niños fans con necesidades especiales. Como todos saben son muchas las películas donde se protagonizan a personajes rudos y musculosos, que no te imaginas a todo un macho fortachón mostrando su lado humano y sencible. Así lo demostró Dwayne Johnson, mejor conocido como The Rock, al tomarse el tiempo entre su apretada agenda para pasar un día con sus fans con necesidades especiales o capacidades diferentes. Son estas acciones que causan admiración en estos actores de Hollywood, quienes, pese a tenerlo todo lo material, también ponen atención en la gente vulnerable. Una vez más, demostró lo importante que son para él sus fans así que documentó en su cuenta de Instagram la experiencia tan hermosa que pasó con los niños con necesidades especiales, y lo tanto que le hizo reflexionar sobre la vida. Thank you universe. I was on set this morning ready to start our shooting day when I got word that there was a family with a special needs young man named RYAN who was hoping to meet me. They understood that they travelled in unannounced but they were willing to wait all day until I wrapped to meet. That would've 12hrs. Way too long. So I asked production to hold and walked across the beach to the barriers where they were waiting. When I walked down the stairs, Ryan's mom (pictured here) was waiting with a huge hug! Her tears started to come as she whispered, "Thank you, thank you". I met Ryan, his brother and his nurse. What a great and cool kid. Without getting into the details, this kid has waaaaaay more heart, is stronger and tougher than I could ever imagine. He can't talk much, but he did tell me, "I love you" in sign language. I thanked him so much for that love. I walked away from this family so grateful to have met them and Ryan. I don't ever take meetings like this for granted and when that mama hugged me today and I felt her start to cry… that stuff gets me every single time I hug a parent in these situations, because I'm a parent too and will do anything to make my babies happy and put a smile on their faces. I know I'm a lucky guy to be in this position and have this platform. I'm grateful and moments like this will always, ALWAYS be the best part of my job. Stay strong Ryan and thanks for teaching me how to sign language buddy. Great meeting you and your family. Thank you universe. Al parecer la fama nunca se le ha subido a la cabeza de Dwayne Johnson, lo cual le hace ganar más fans, aún, y claro esto nos deja una gran lección también.